April 20, 2017 Chapters 9-11 Facilitated by Robin D.G. Kelley, Professor and Gary B. Nash Endowed Chair in U.S. History, UCLA The following materials were offered to participants after the class to supplement the group discussion. Video of this session is below. The Center for Political Education is excited to welcome Dr. Maryse Narcisse of Fanmi Lavalas to the Bay Area on April 23rd. 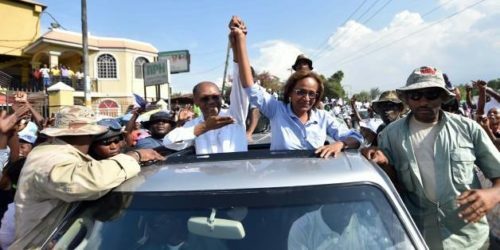 We believe her visit is a important opportunity to be in solidarity with the struggles of the Haitian people. April 5, 2017 Chapters 7-8 Facilitated by Phil Hutchings, Black Alliance for Just Immigration The following materials were offered to participants after the class to supplement the group discussion. Video of this session is below. In his powerful presentation to the Reading Black Reconstruction study group, Phil Hutchings mentioned two books that he thought were good complements to Black Reconstruction. March 23, 2017 Chapters 1-6 Facilitated by Paula Austin, Assistant Professor of History, Sacramento State University The following materials were offered to participants after the class to supplement the group discussion. Video of this session is below. Capitalism (here’s a definition we’ve found useful to think about in relationship to what was offered during the session): Capitalism is an economic system in which a small number of people maintain ownership and control of the machines, raw materials, people’s labor, and land needed to make goods (means of production) and the means of distributing and generating profit from those goods. 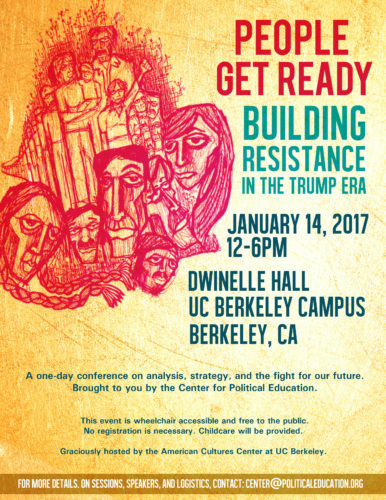 On January 14, 2017, just days after the disastrous Donald Trump electoral victory, the Center for Political Education hosted a one-day conference where nearly 600 organizers, activists, and community members gathered to understand the political moment, fortify themselves, and to get organized for the fights to come.